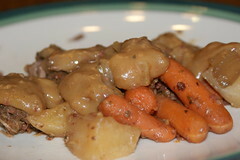 I always love easy to make slow cooker recipes. I love being able to throw together a few things in the morning, and then have supper ready for that evening. Like tonight, Bill was over an hour late, but the kids and I were able to eat. Mix broth, dressing, BBQ sauce, and oregano in a bowl. Put all remaining ingredients in the slow cooker except for the flour and water. Pour bowl mixture over the ingredients in the slow cooker. Cover and cook on low for 8 - 9 hours (or 4 - 5 hours on high). Fifteen minutes before you want to serve, use a slotted spoon and transfer meat and veggies to a serving bowl. Cover with foil. In a bowl, mix the flour and water until well blended. Stir into slow cooker. Cover and cook on high for 15 minutes. Spoon over meat and vegetables. Make sure you follow us on Facebook, so you don’t miss any of our recipes! To toast almonds, place them on a baking sheet. Bake at 350 degrees until lightly browned which will be around 5 minutes. Stir once to keep the nuts from burning.